Bess Hepworth (she/her) is the Founder and Executive Director of Planet Ally. She is an Australian born social media scientist, international speaker, curator, wife and Mother of 2 young boys. Bess lives between Hong Kong and Australia and has a background in community development and high performance sport. Bess has represented Australia as a youth footballer and coach as well as recently represented Hong Kong in cricket. Bess currently serves in advisory board roles for the UNDP’s Being LGBTI in Asia, Asia-Pacific Transgender Network and International Family Equality Day. She is also Co-Founder of the Asia-Pacific Rainbow Families Network as well as the Founder of the Miles of Love Travel Advocacy Forum and the Human Dignity Festival. 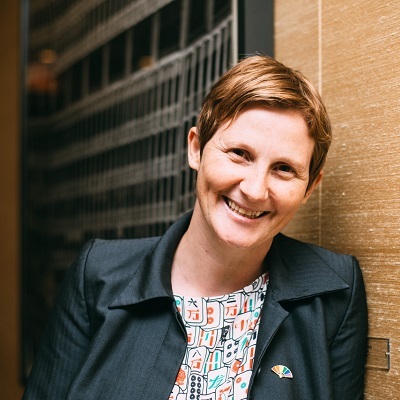 Bess has been named in the Top 10 people to follow on Twitter for Business and Inclusion, Runner-Up in the 2017 RAHM Global LGBTI Leadership Contest and regularly features in the Top 400 in the Global LGBTI Power Twitter List. She is former TEDx curator, advisory Board member for Social Media Week Hong Kong and formerly Directed Pink Season, Asia’s largest LGBT Cultural Festival, has been Coordinator for IDAHOT Hong Kong and also Events Coordinator for Kids Ocean Day in Hong Kong. Bess was a Co-founder and coach of Australia’s first women’s refugee football team, a guest women’s football coach at the 2008 Homeless World Cup as well as FIFA media liaison at the Sydney 2000 Olympic Games. Most recently, prior to founding Planet Ally, Bess worked as APAC Partnerships and Community Manager for global LGBT business organisation Out Leadership. Prior to her 4-year role at Out Leadership, Bess ran a successful corporate team building company focused on creativity, productivity and performance. Bess now spends much of her time between raising her sons and being the proud founder of Planet Ally. An active LGBTI community member in the Asia-Pacific region and champion of positive change, Bess specialises in using social media as a tool for visibility, solidarity and advocacy for LGBTQI communities.